At Great South Harley-Davidson®, enjoy the 'Freedom to Buy', even from a private seller. 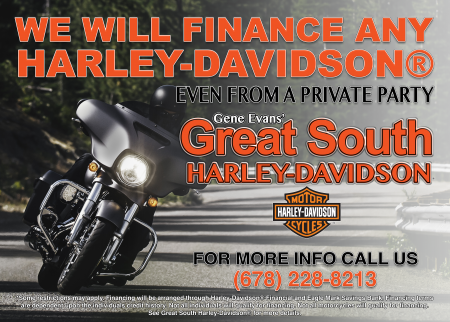 Great South offers our Rider-to-Rider program which allows you to finance your new motorcycle through Harley-Davidson Financial Services (HDFS), even if your are not buying it from Great South Harley-Davidson®. Also, our Harley-Davidson® Authorized Service department will perform a free multi-point inspection on your new motorcycle before you buy it. This gives you the reassurance and piece of mind that you get from purchasing your motorcycle from Great South Harley-Davidson®, even if you buy it from someone else. In addition, some motorcycles may qualify for addition warranty through Harley-Davidson®.